If you are looking for some cute printable notes to put in your kiddos lunch boxes leading up to Valentine's Day, check out these Valentine's Day lunch box jokes Kristen made for her kiddos. If your kids don't take their lunches they would be cute to leave in their backpacks or even on their pillows at night. You can put them in a Valentine's Day countdown calendar instead of candy, since they will be getting enough of that on February 14th anyway! 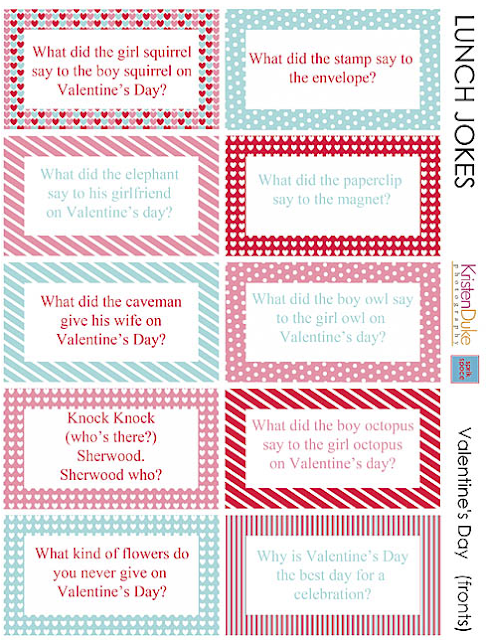 You can get the free printable Valentine's jokes over at Kristen Duke Photography. The "backs" must be great, too!